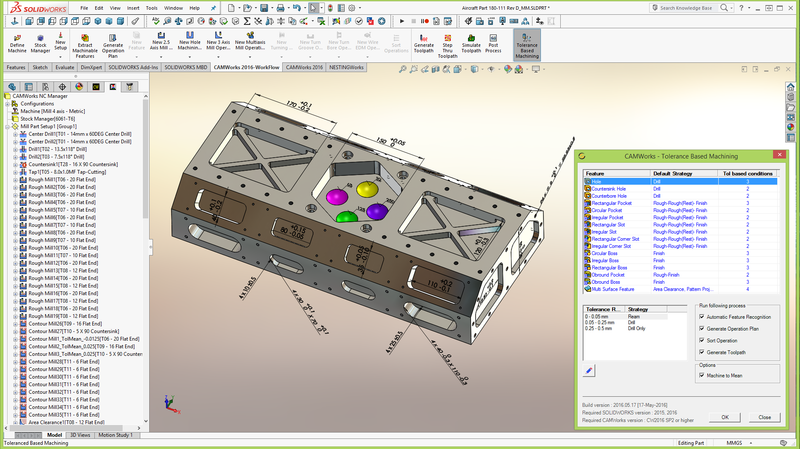 Scottsdale, AZ, USA, & Mumbai, India – June 30, 2016: Geometric Ltd. (BSE:532312, NSE:GEOMETRIC), a global leader in 3D CNC machining software, today announced the availability of a revolutionary new technology that uses SOLIDWORKS 3D DimXpert and Model Based Definition (MBD) 3D dimensions and annotations to automate the programming process for CNC machined components. Aligning with industry initiatives such as Smart Manufacturing and Industry 4.0 for advanced manufacturing, CAMWorks has been uniquely structured to realize the benefits of automated CNC program generation based on tolerance, surface finish, and other annotations in SOLIDWORKS 3D parts. This functionality is possible due to CAMWorks’ ability to extract manufacturing features like pockets, bosses, holes, etc…, and automatically create toolpaths based on an internal knowledge base of user definable tools, feeds, speeds, and strategies. CAMWorks, a parametric, solids-based CNC programming software system, brings in a revolutionary way to help machinists around the world program smarter and machine faster. CAMWorks significantly reduces programming time and removes the drudgery from CNC programming by using patented Feature Recognition technology in conjunction with full toolpath to solid-model associativity and knowledge-based machining. For more information, go to www.camworks.com.